New to milling plastic. Here I am using an Amana 1/16 " O-flute downcut. Nice cut but it left a bunch of these little strips that I have to remove by scraping lightly. Stepover was at 40%. Should I cut it in half? It’s hard to tell from the picture, are the strips coming from the sidewalls, the bottom of the pocket, or both? Be sure you know the -real- diameter of the tool (ie. measure it with calipers). In my experience most router bits are undersized a little, and that can cause this. 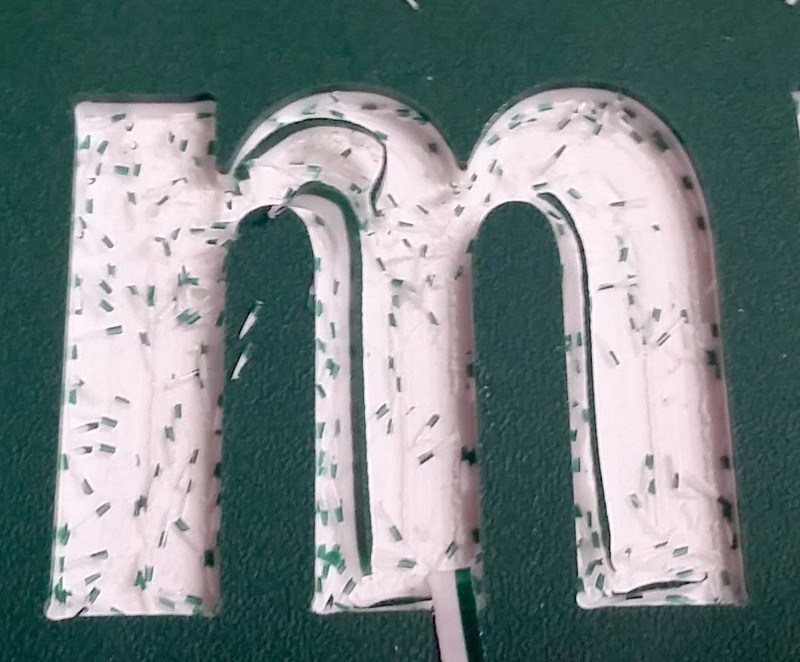 I did wonder about under-sizing since these are from the center of the letters where it is just clearing material. With wood these would just splinter and get sucked up into the dust extractor. To answer the other question yes it is soft plastic. You can clean up the machining with your fingernail. On previous posts about using this material folks dis’d me using a carbide #111 ball nose but I have to say that I think the results are better than my expensive Amana O-Flute. Fewer tool marks. Still fairly clean cuts on the sides. I actually did rerun it with a different font using 22% stepover and it was a little better but still had some “ribbons” on the bottom. Interesting - you had -way- less than 100% stepover and still had some ribbons. Is this a center cutting tool?